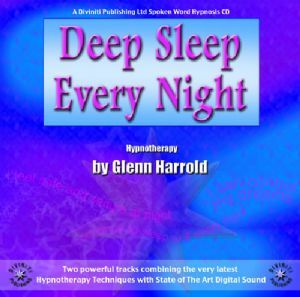 Overcome the stressful problem of insomnia with this superb, high quality hypnosis CD by Glenn Harrold. Insomnia and sleep problems are often caused by stress, anxiety and having a busy mind at the end of the day. Hypnotherapy is uniquely effective in solving sleep disorders in a safe and natural way, free of any harmful side effects. Track 2 is titled 'Lucid dreams for problem solving'. This track is also a hypnotherapy session that will induce a restful nights sleep, and will help cure sleeplessness and bad dreams as well as guiding you to find solutions to any problems through your dreams. The pink noise background sound effects on this title have been designed to sync with, and slow down brainwaves to alpha level (between 6 - 10 Hz), which is a pre requisite for a good nights sleep. Even the most ardent insomniac can't fail to wind down with this powerful relaxing hypnotherapy CD. A pleasant relaxing voice guiding the listener into a completely relaxed state of mind & body. Hypnotic echoed background vocals panning from left to right across the stereo range - a deeply relaxing and unique effect. 60 B.P.M digital sound effects - all compounding the overall effect.